Developing cookbooks and recipes (and authoring them using Ruby). Keeping the chef-repo synchronized with version source control. Using Knife to upload items from the chef-repo to the server. Configuring organizational policy, including defining roles and environments and ensuring that critical data is stored in data bags. Interacting with nodes, as (or when) required, such as performing a bootstrap operation. Chef workstation requires when you want to interact with the chef server, or any chef nodes (servers, network equipment, etc). 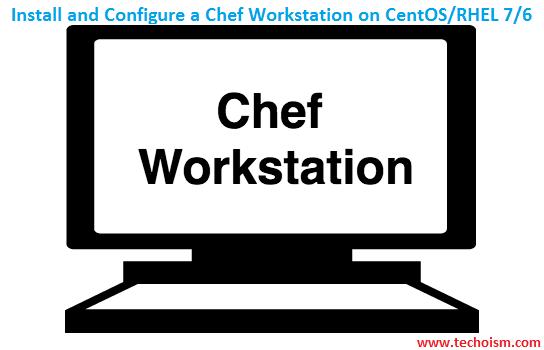 On Chef workstation you create cookbooks or recipes that will be executed on the individual chef nodes. First we need to install below packages. ChefDK stands for Chef Development Kit. ChefDK is available for all the platform. You can download the ChefDK latest package from official website also. Install the RPM package using below command. Now we will run below command to verify all different components that comes with ChefDK to make sure they all works properly without any issues as shown below. [WARN] This is an internal command used by the ChefDK development team. If you are a ChefDK user, please do not run it. Verification of component 'fauxhai' succeeded. Verification of component 'kitchen-vagrant' succeeded. Verification of component 'openssl' succeeded. Verification of component 'delivery-cli' succeeded. Verification of component 'test-kitchen' succeeded. Verification of component 'opscode-pushy-client' succeeded. Verification of component 'berkshelf' succeeded. Verification of component 'chefspec' succeeded. Verification of component 'knife-spork' succeeded. Verification of component 'tk-policyfile-provisioner' succeeded. Verification of component 'chef-dk' succeeded. Verification of component 'inspec' succeeded. Verification of component 'chef-sugar' succeeded. Verification of component 'chef-client' succeeded. Verification of component 'package installation' succeeded. Verification of component 'chef-provisioning' succeeded. Verification of component 'generated-cookbooks-pass-chefspec' succeeded. Verification of component 'git' succeeded. Note: Some times we get error message “Could not find ‘chef-config’ (= 12.8.0) – did find: [chef-config-12.7.2] (Gem::LoadError)””. This error is coming because your setup is not matching with a ChefDK version so upgrade the ChefDK package to resolve the issue. When installation finished use below command to verify the version. Use below command to show the version number of ChefDK and all the components that comes with it as shown below.